MODEL NS80 – The Carrolton - MOST POPULAR! Warner Brothers Films and Paramount Pictures commissioned these and others like The Northfield shown at left. 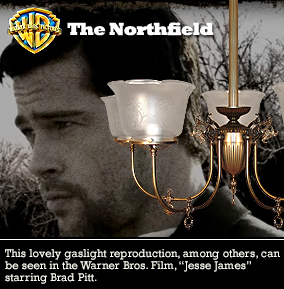 These Victorian style gaslight vintage reproductions were specially designed for the film 'The Assassination of Jesse James by the Coward Robert Ford', starring Brad Pitt. This is another custom fixture designed to match our other chandeliers and wall sconces for the movie and to meet the design styles of the period of the mid to late 1800's. 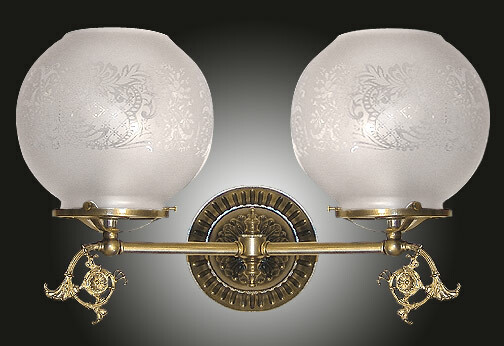 Features a pair of stunning French acid etched glass globes and historic accuracy. Width 18 In. / Projection 11 In. / Depth 13 In.